A survivor from the family who lost nine relatives in a tourist boat accident in the US has said the captain told passengers not to bother grabbing life jackets. Tia Coleman told an Indianapolis television station that she and a nephew were the only survivors among 11 relatives aboard the boat. She said she lost all her children, but she did not say how many. Her comments came as vigils were held by a grief-stricken community following the death of 17 people in the boat accident in Missouri. At one memorial, about 300 people gathered in the car park of Ride the Ducks of Branson and sang Amazing Grace. Mourners at a church sang the same words. 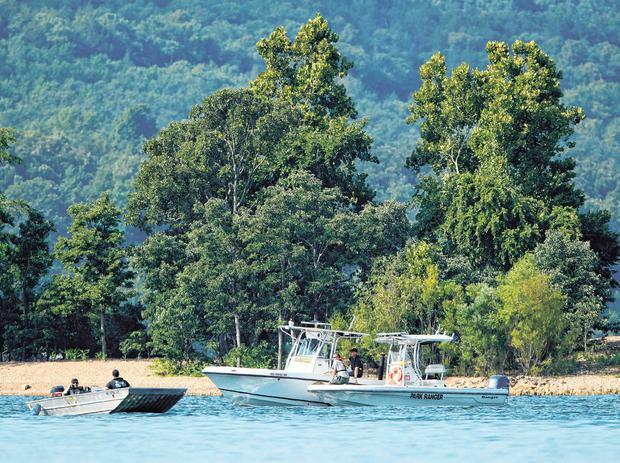 Divers found the final four bodies on Friday in Table Rock Lake, near Branson, after the deadliest accident of its kind in nearly two decades. Investigators were trying to determine what sent the vessel known as a duck boat to its demise. An initial assessment blamed thunderstorms and winds that approached hurricane strength, but it was not clear why the amphibious vehicle even ventured out into the water. Officials have not released the names of the victims, but the sad details emerged throughout the day. Among them were a popular duck boat driver, a father and son visiting from Arkansas, and nine relatives from Indiana, many of them children, who were on the ill-fated boat only because of a mix-up. The National Weather Service in Springfield, about 40 miles north of Branson, issued a severe thunderstorm watch for its immediate area on Thursday, saying conditions were ripe for winds of 70mph. It followed up at 6.32pm with a severe thunderstorm warning for three counties that included Branson and the lake. The warning mentioned both locations. The boat went down about 40 minutes later, shortly after 7pm local time. A full investigation was under way, with help from the Coast Guard and the National Transportation Safety Board. Stone County Sheriff Doug Rader urged anyone with video or photos of the accident to contact authorities. Suzanne Smagala, of Ripley Entertainment, which owns Ride the Ducks in Branson, said the company was assisting authorities. She said this was the company’s only accident in more than 40 years of operation. Twenty-nine passengers and two crew members were aboard for a pleasure cruise. Seven of the 14 survivors were hurt when the vessel went down. At least two children and two adults were still in hospital on Friday afternoon. The captain survived, authorities said. Among the injured was 14-year-old Loren Smith of Osceola, Arkansas. Her father, 53-year-old retired maths teacher Steve Smith, and her 15-year-old brother, Lance, died in the accident. Loren suffered concussion but survived. Tracy Beck, of Kansas City, Missouri, said she recalled the family who lost nine members waiting in line and blamed a possible ticket mix-up for them ending up on the ill-fated boat. She said the ticket taker realised after they stopped for a photo that they should have boarded at a different location and assigned them new tickets. Shehab Khan A two-year-old girl was shot and killed by her four-year-old cousin, police said, after they arrested their grandfather.